Ok, fine, I admit that it was not as pressing as “How exactly do I hold her…should I give her formula…how should she sleep…can she lay like that…?” And other common first-time parent questions. My wife and I had already agreed to raise our daughter bilingual, but we did not really know how to do that. I began with some basic web browsing, and landed on a few sites. From there I began to become a ‘bilingual parent nut’ (which led me to my current profession of writing bilingual children’s books). I want to share with you 5 outstanding blogs which have been with me through this journey, and have given me great concrete advice, theory, understanding, and community. This website is phenomenal. So much amazing, well-designed, thoughtful content. Consistent updates, a huge community, and two co-founders who really live the bilingual parent life. SpanglishBaby was founded by Ana Flores and Roxana Soto. These two Latin moms have different upbringings and stories, but share the common theme of living this new ‘bi-cultural’ life in the United States. This site is a must visit, and often. Also, these two wonderful women have written “Bilingual is Better” – a book about raising a bilingual child, their stories, and it a strong read. This site was founded by Cory Heller, and American who married into a German family. This led her on the path of learning German herself, in order to teacher her three children. Her story, life path, and viewpoints are very much in line with myself (as I was also non-native, taught myself Spanish, in order to teach my daughter). This site is not just about English/Spanish, but takes in more language situations, such as multilingualism. 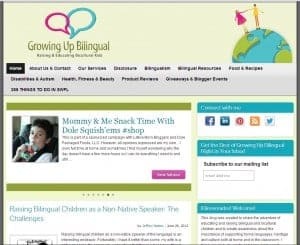 Founded by a Guatemalan family who moved to the United States in 2008, Growing up Bilingual is an online diary, resource, and center for like-minded parents. I like that this site takes a look into education, and even learning disabilities. This is one to keep on your radar, and visit from time to time. Mommy Maestra is the go-to site for homeschooling (and raising) bilingual children. This blog is well devoted towards activities, learning challenges, crafts, teaching how to read, math, and more. The site has a HUGE amount of content, and will keep your children busy, well, for years. I added SpanishDict to this list, not necessarily because it is purely a blog (although it does have an interesting blog), but because it is highly recommended for you to learn Spanish. If you are learning Spanish yourself (along with your children), I recommend going to this site, click on “Learn” (I think you need to create an account), and get started. There are very well done lessons going over everything from Level 1 to Level 4 in Spanish. 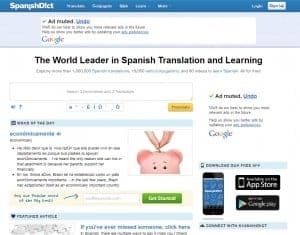 This site was invaluable (and free) in my quest to master Spanish. Mom Loves Best was founded on the principal of mothers helping mothers to build better families. Mom Loves Best boasts the work of Jenny Silverstone along with medical reviewers Michelle Roth and Caitlin Goodwin. Are you doubting yourself and your ability to raise happy, healthy, and well-balanced children? Mom Loves Best gives excellent support with judgment-free and totally relevant advice and information on parenting with topics ranging from playtime, reading, life at home with kids, bilingualism, and more. Ultimate Guides to all things related to pregnancy and parenting. Reliable reviews for products, sites, and services marketed towards babies, kids, and parents. Hello: I just published a bilingual children’s book with the main purpose to be for children to gain understanding, at a very young age, that immigration and transitions are tough on other children. Hope you would consider adding my website to your already amazing listing! These are great, thank you for sharing! I’d like to add my own site to the list, which is still in its infancy, but which is aimed at sharing lots of every day resources (shows, books, songs, etc.) for families raising their children to speak Spanish or Slovak.